Most attractions don’t have guided tours for tourists, even if they have, the availability of the tour is either insufficient or inconvenient. For example, Sweet Auburn in Atlanta has a well-planned Martin Luther King Jr historic site, including MLK birth home, Ebenezer Church, etc. The ranger-led tours are easily full and don’t allow apply in advance. 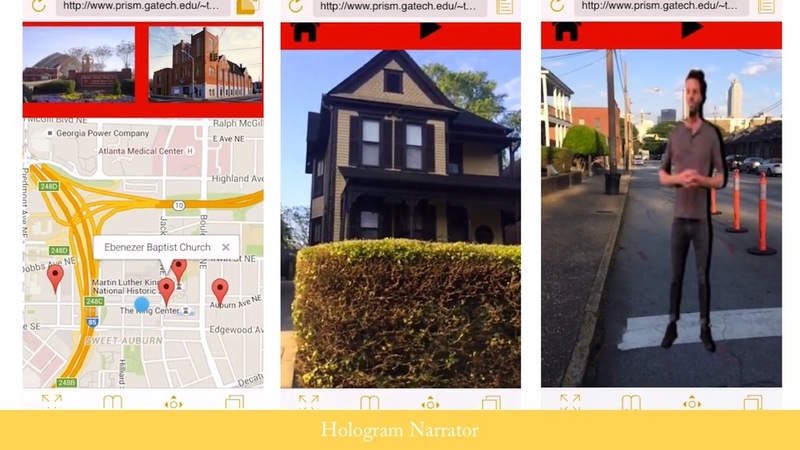 Thus, "Hologram Narrator" creates an interactive and vivid AR tour to assist the visit. It is designed for a wide using scenario, but focusing on Sweet Auburn as a specific example in this demonstration. In this mix reality design project, we based our design on the "Augmented Reality Argon browser" invented by Georgia Tech Augmented Environments Lab (AEL). Our design process started with a brainstorm session to scope our topic and features, under the requirement of applying AR to touring Sweet Auburn area. After forming clear goal and structure of our app, we designed the overall tour experience walkthrough and considered the interaction on the app. We then went on a real site visit to observe visitors' behaviors and needs in Sweet Auburn and to gain information about the ranger-guided tour. By taking into consideration the possible interactions and difficulties of touring with an app, we then developed a user task flow and started with the content production and software development to make a workable prototype. To begin with, we designed a tourist experience walkthrough using our app, including finding places of interests, getting place-specific information, and experiencing AR technology at the location. We also decided our app to have a complete structure containing different tour districts in Atlanta than only focusing on Sweet Auburn, to allow generalization for a wider usage in the future. The default mode of the app is a 2D map. The app allows the user to explore tour attractions nearby and get geographical and historical information about them. This is achieved by providing the user the option of choosing a neighborhood around them, and subsequently showing the attractions in that neighborhood. These attractions can be classified according to the user’s interest based on keywords such as arts, music, history, and more. Once the user selects an attraction, the user can view general information about the attraction such as distance to pin location, visit hours, visit duration, and popularity. When the user approaches the attraction in a radius of 20 feet, the app switches from a 2D map to camera mode, while giving a haptic feedback. The user is given some cues to search for the tour guide using the camera, who will be at a certain fixed position near the attraction. Once spotted, the user can then choose to begin the tour with a simple tap. After the user chooses to begin the tour, the AR video of the tour guide starts to play on top of a camera layer. The user can choose to play, pause, skip, or replay the video. The user may also end the video by going back to the home screen. While playing the video, if the user minimizes the app, the video pauses automatically. It only resumes when the user reopens the app. In case the user points the camera away from the tour guide, the user will still be able to hear their narrative. The AR tour guide will be in a still state before the user begins the tour. The interaction with the guide will be as natural as possible. For example, the dimension of the guide’s size will be in proportion with respect to the environment. If the user zooms in or out of the screen, the corresponding image on the screen should be natural with respect to the environment. The guide will be geolocated in one fixed position, and always face the user, independent of the motion of the camera. In the future, the app would also have enough logic for the user to be able to hold a conversation with the tour guide. In order to write the script for the tour, we took inspiration from the National Historic Site tours of the MLK Jr. birth home as well as literature of both the home and Ebenezer Baptist Church. In addition to the NHS literature, we also looked at online materials describing the history of the Williams and King families and Ebenezer, and produced two scripts, of roughly 3 minutes, for each location. With the help of an actor friend and borrowing equipment from Georgia Tech Communications Center and LMC Films, we shot two green screen videos, which were later edited to produce the combination composite and alpha channel image that could be used to place our “tour guide” into the Argon browser’s camera view.